To produce the very best quality product (Museum Quality) we use all acid-free archival materials, from the paper to the mat, and even the hinging tape and corners. 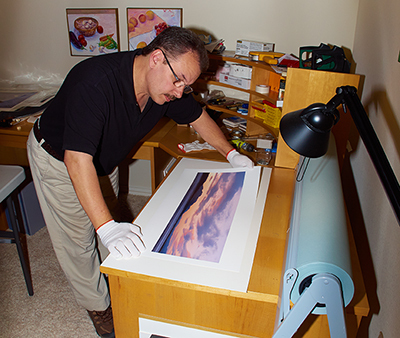 We take as much care with the printing and matting as we did with the photo itself. Everything is State of the Art. For a more in-depth look at Quality and Terminology, please read this additional one-page article. These papers and inks are currently the best on the market for longevity, or permanence, and will last for 100 years under normal conditions, showing no fading in color. This means that you can enjoy our Fine Art Prints for the rest of your life. To ensure that you are comfortable with your Art purchase, the following Warranties are given with all of our Fine Art Prints. 90-Day Satisfaction Guarantee - We know you'll be happy with your purchase. To make sure, we offer a 90-Day money-back guarantee for all Fine Art Prints. If for any reason you are not happy with your purchase, return it for a refund or exchange, minus shipping charges. Please contact us to arrange any returns. Lifetime Fade Free Warranty - All Fine Art Prints are guaranteed against fading for as long as you own them. As shown above in our Statement of Quality, the paper and ink used are tested and rated to maintain their original color balance and saturation for a hundred years and more. Lifetime Framing Warranty - All framing done by us is guaranteed not to damage the Art work for as long as you own it. Our Fine Art Prints are protected with acid-free Matboard and Foamboard. The assembly is done with acid-free linen tape, polyurethane corners and strips. The Frame backing paper is also acid-free, so there is nothing that can come in contact with the Art. If anything should happen, just return it to us for a replacment. Since we use all Museum Quality materials during Matting and Framing, there is no risk of Acid damage to the Mat or Print. The two remaining issues are Moisture and High Temperatures. If the Art is hung in a place that is temperature controlled, meaning inside a home or office, those risks are removed as well.